To make this salad your own, feel free to use any cooked grain you’d like (a hearty grain like farro or wheat berries would be great as would a more delicate grain like millet). Then simply add 1 1/4 cups chopped fresh herbs of your choosing (mint, basil, chives, parsley, cilantro — anything goes) along with 3 cups of your favorite cooked spring vegetables. Cloak it all in this easy lemony dressing and you’ve got your own version of this simple lunch salad. Prepare an ice water bath in a large bowl. Bring a medium saucepan of salted water to a boil. Add the asparagus and cook for about 2 – 2 1/2 minutes, or until just barely tender (it will continue to cook just a bit out of the water). Drain and quickly to ice water bath to stop the cooking. Drain again then towel dry and slice into 2-3 inch pieces. To make the dressing, simply whisk together all ingredients in a small bowl. Add a few grinds of fresh pepper and set aside. 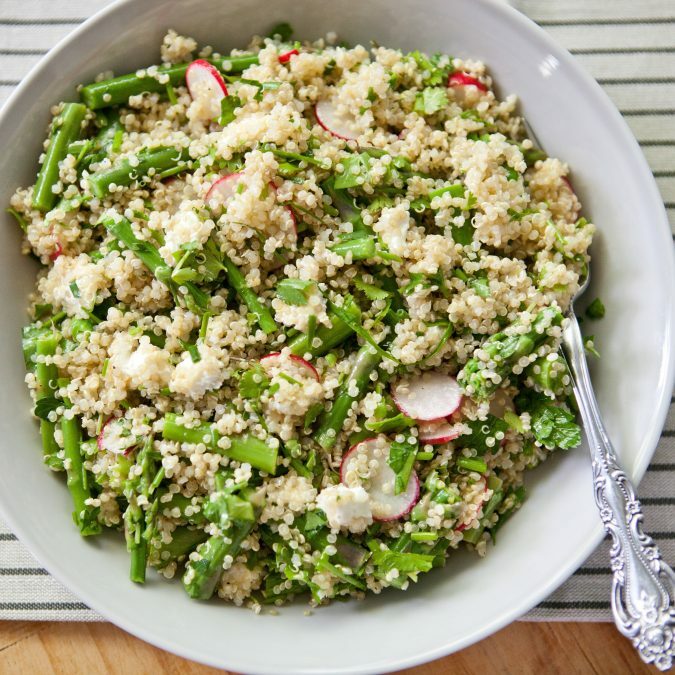 In a large salad bowl, combine cooked quinoa, asparagus, radishes, and herbs. Toss with dressing. Season with additional salt and pepper as needed. Fold in goat cheese and serve. Refrigerate any leftovers for up to 3 days.